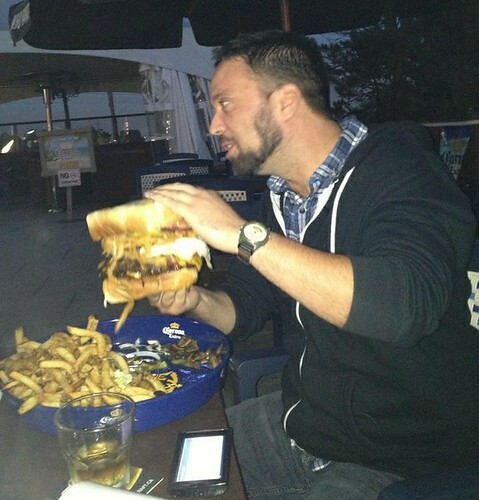 Bogy’s Wall of Fame Challenge Burger – I WILL EAT YOU! Served with 2 lbs of fries and dipping sauce. So, yes. Basically it’s a monster. And if are able to eat the entire thing in under 30 minutes, it’s free (otherwise, it’s $24). You also get a free t-shirt and your picture up on their Wall of Fame. Apparently, only two people have been able to do this so far. Ultimately, this monstrosity ended up being four very tasty meals for myself. It’s actually really good, just too damn big. Of course, that’s the whole point of the thing, I guess. So, yeah. If this sounds good to you, please check Bogy’s out. It’s a pretty good sunny weather beer joint with a burger that will make you hate yourself.